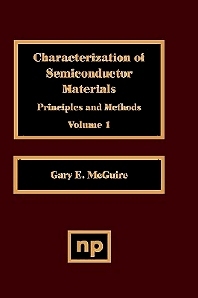 Characterization of semiconductor materials and methods used to characterize them will be described extensively in this new Noyes series. Written by experts in each subject area, the series will present the most up-to-date information available in this rapidly advancing field. Includes chapters on Electrical Characterization, Ion Mass Spectrometry, Photoelectron Spectroscopy, Ion/Solid Interactions and more. Material scientists in the semiconductor and microelectronics fields.